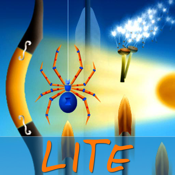 Whether you are a bow hunter or just like to play Cupid sometimes, “Super Bow (Lite)” will help you sharpen your aim, ready your reflexes and provide you with many moments of good fun!! Enjoy easy controls, animated targets and action arrow flights. The graphics are gorgeous with two different scenes in four different levels. Progress from Bow Beginner to Super Shot as quickly as you can master Super Bow. 6. But be sure to avoid the bombs!